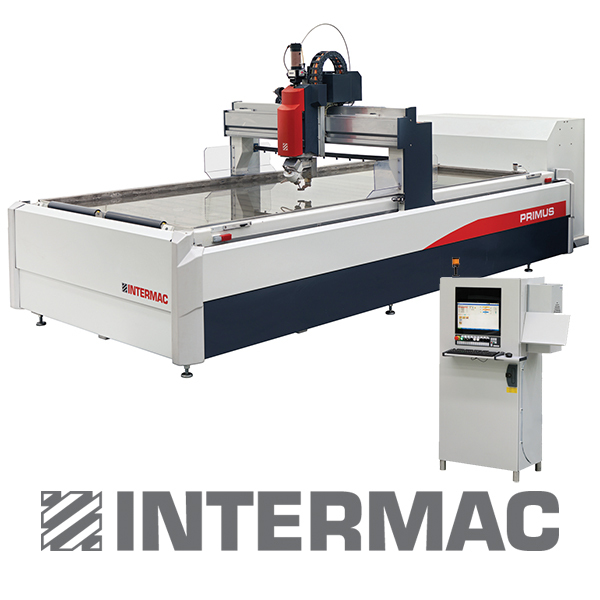 Primus is Intermac’s water jet machine for cutting stone and glass applications. The Primus is simple to use, offers reduced maintenance and high productivity and easily cuts composite materials, synthetic stones, non-metallic alloys, titanium, aluminum and ceramic materials. With Primus you get a combination of productivity and the versatility water jet technology is known for – along with the reliability and the ease of use Intermac solutions deliver. The cut is possible through a supersonic jet, concentrated through a calibrated hole, a water flow with the pressure about 413,7 MPa (about 60.000 psi) produces a coherent jet of water projected at almost three times the speed of sound (810 m/s). The jet can be added with abrasive, according to the materials to be cut, and is directed against the surface of the work-piece; able to separate the parts by means of dual action: erosion and abrasion combined. The enhancement of the water pressure is by a volumetric pump, specifically hydraulically-driven, called “ultra high pressure intensifier”. It determines the cut potential of the system. Intermac Primus 184 is shown.